Saw this on one of my media hunts. 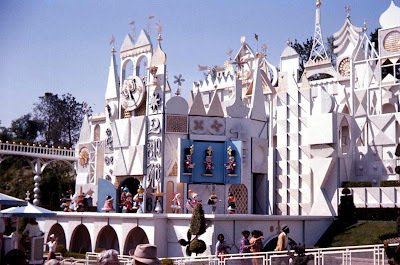 The, "It's a Small World" attraction at Disneyland is being shut down so that they can make the canal deeper and wider. It seems that that boats are getting stuck more frequently. Disney claims it's not due to the increasing weight of the occupants, but rather due to fiberglass patching of the boats over the years. Of course Disney also rightly notes that the average weight of an adult has gone up at least 25lbs in the 41 years since this ride opened when the average man weighed 175lbs and the average woman 135lbs. Apparently this is happening so frequently that at one of the trouble spots (Canada) they built an exit ramp. "the Cast Member's operating the ride try their very best to eyeball the girth and size of the riders coming down the line and purposely leave a row or two empty on many boats nowadays to hopefully keep them floating, even those discreet tactics don't always work with today's riders." There is a silver lining however - for the next 10 months you can take your kids to Disneyland and not have to sit through that ridiculously annoying song. Stay tuned tomorrow when I discuss my weekend radio discussion with Dr. Barry Dworkin which had the communications director of the Heart and Stroke Foundation pull the plug on Barry's interview with the folks from Health Check right before we would have started our round table discussion. To give you a taste, I will leave you with one question therein - if you built a series of recommendations on a solid foundation of evidence would you ever pull the plug on an interview where you'd have a chance to defend them?